Fist fights, teachers assaulted and classrooms vandalized. Students, parents and teachers say bullying has gotten worse at some schools as the district moves toward a new Code of Conduct for the entire district -- affecting 48-thousand students. The bullying is so severe at Secrist that the district fired a principal last semester. And now some students, parents and teachers at Booth-Fickett say it's no different there. 8th grader Braeden Pahl describes a fist fight just last week inside Booth-Fickett, which is a kindergarten through 8th grade school. "There were two kids in the hallway and they were fighting. Throwing fists at each other trying to beat each other to the ground and wall and people were gathering around yelling fight," said 8th grader Braeden Pahl. The fist fight, he said, lasted about 10 minutes. "The teachers tried to intervene and stop the fight as soon as possible, but the kids kept pushing them back." His younger brother, Trevor, says he's been pushed around and choked. "It was hard to get out of the choke because there were three of them," said Trevor Pahl. Braeden Pahl: "People bring knives, they bring alcohol, they bring illegal substances." Cavazos: "You've seen all of this?" And even teachers are bullied. "My youngest called me during class because a substitute was being assaulted and stuff was being thrown at her," said Danette Pahl. Cavazos asked 6th grader Robert Speer, "Do you feel safe at school?" He answered, "Not at all." 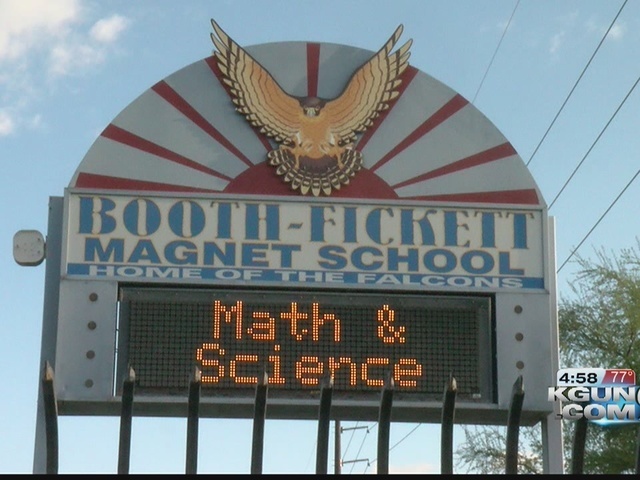 The 3 Booth-Fickett students stood before the Governing Board last week to make their case that the district is headed in the wrong direction. Why did the bullying get so bad? Several teachers told KGUN9 that TUSD has been moving to a more lenient Code of Conduct for the entire district. It's focused on finding root causes of bad behavior to prevent suspending and expelling students, but teachers says they've received little or no training in the more lenient discipline practices. Danette Pahl said, "I know that the teachers are asking for assistance and they're asking for backup and they're not getting it." And the disruptive students -- the bullies -- know it. "And when kids find out that they can get away with stuff, they continue to do it," said Governing Board member Michael Hicks. Hicks supports a new Code of Conduct, but at this point believes more resources would be needed. Hicks: "We're going to have to hire social workers and counselors to be able to deal with the issues these kids are doing if (proposed Code of Conduct) comes forward to us." Cavazos: "Does that fit in the budget?" Hicks: "No. We're not hiring people now." Kathleen Scheppe, a TUSD K-8 director, attended a parent-led meeting with students, teachers and parents at Booth-Fickett Monday to hear about their concerns. KGUN9's Valerie Cavazos also attended. "When we heard their concerns we're looking to go on campus and hear from more people, to hear what their issues are because we really want to support the schools," said Scheppe. Scheppe told KGUN9 a plan to address staff concerns is in the works. A professional development team will train teachers this summer. "So people are up to speed on the best strategies because we want to feel we have the right tools to address the students in the classrooms." When will the board vote on the proposed Code of Conduct? Hicks doesn't know. The district is still working on it. Meantime, the district said it's investigating the bullying at Booth-Fickett and Secrist.